Ryan Tafazolli (5, centre) heads Posh in front against MK Dons. Photo: Joe Dent/theposh.com. It’s a sign of Grant McCann’s growing confidence in himself as well as his squad that he dares to make favourable comparisons with successful Peterborough United teams of the recent past. Okay the manager was merely pointing out after this ultimately comfortable victory last night (September 12) that the line-ups he played in regularly used to roar into action when attacking the end housing the most vocal Posh fans, but the inference was clear. Adopt more of the the habits of the 2010-11 team (post-Gary Johnson) and maybe the outcome will be the same. It’s not a bad benchmark to be fair. Posh substitute Leo Da Silva Lopes is all smiles after victory against MK Dons is confirmed. Photo: David Lowndes. Top scorer Jack Marriott is a Craig Mackail-Smith clone as his impressive workrate will always mask any technical issues (he’s also caught offside a lot less) while Marcus Maddison, like George Boyd before him, provides a game-changing X factor for a team managed by a relatively young man. Maddison’s goal and assist in the opening eight minutes of the second-half pretty much confirmed victory against a team whose performance on and off the field made a mockery of previous big matches between these clubs. There was little of the passion of those encounters in evidence here - there wasn’t even a single caution - and the miserable away following ensured only local TV stations would refer to these meetings in future as ‘derby fixtures’. Indeed the first half was as flat as Theresa May’s General Election performance. Posh bossed the ball, but threatened only when Gwion Edwards was tearing down the left-wing or when Maddison was whipping in delicious set-pieces made all the more difficult to defend by ‘Storm Aileen’s’ opening salvo. McCann, after making no changes to his League One starting XI all season, had morphed into Graham Westley yesterday afternoon, only with a much happier ending. 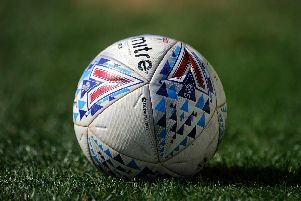 Out went four players including the skipper and among the in-comers were right-back Liam Shephard and striker Ricky Miller for their full Posh debuts. Former skipper Chris Forrester was recalled to continue his search for top form last seen at Stamford Bridge in January and a 4-4-2 formation was employed which was presumably an unwelcome surprise for visiting boss Robbie Neilson and a happy one for Posh chairman Darragh MacAnthony who loves simple systems designed for attacking football. Posh substitute Junior Morias on the ball against MK Dons. Photo: Joe Dent/theposh.com. Shephard played very well in an orthodox full-back position, but it’s the presence of cult hero Miller that captivated the home fans. Moments after Maddison had inspired Posh’s two-goal advantage, the home crowd - a decent number suggested Bretton had been emptied of residents again - were singing songs about Miller. Lord only knows what the reaction will be when he scores for the first time at this level and he did deliver a glimpse of his potential by smashing one shot into the roof of the net in between the two Posh goals - an assistant referee’s flag quickly subdued the celebrations. Maddison’s corner - one won by Miller’s snapshot - was headed home by Ryan Tafazolli 90 seconds into the second-half and the star man scored himself soon afterwards after driving at the home defence and sliding a shot into the bottom corner. Gaps to match those in the stand containing the visiting support started to open up in the Dons defence, but a combination of decent goalkeeping from Lee Nicholls and some kind deflections ensured Posh didn’t score again which was a shame for substitute Leo Da Silva Lopes who slalomed his way into the penalty area late on only to be denied a breathtaking goal by the legs of Nicholls. But this was a strong response to the disappointment of the weekend. Marriott and Miller were a constant menace when the game became stretched, Maddison revelled out wide and Forrester’s energy levels were high and almost rewarded with a goal from a clever near-post flick from a right-wing cross, while Steven Taylor and Tafazolli were strong enough to cover for the occasional occasions when MK surged through the centre of the Posh midfield with alarming ease. Posh full debutant Liam Shephard gets to grips with MK Dons striker Kieran Agard. Photo: Joe Dent/theposh.com. McCann reckons he has a selection dilemma this weekend, but Anthony Grant returning to the starting line-up at Walsall is a bigger certainty than an early Champions League exit for Celtic. Posh: Jonathan Bond, Liam Shephard, Andrew Hughes, Steven Taylor, Ryan Tafazolli, Gwion Edwards (sub Leo Da Silva Lopes, 77 mins), Chris Forrester, Michael Doughty, Marcus Maddison, Jack Marriott (sub Junior Morias, 86 mins), Ricky Miller (sub Idris Kanu, 79 mins). Unused substitutes: Conor O’Malley, Jack Baldwin, Danny Lloyd, Jermaine Anderson. MK Dons: Lee Nicholls, George Williams, Dean Lewington (sub Osman Sow, 57 mins), Scott Wootton, Ousseynou Cisse, Scott Golbourne, Kieran Agard (sub Aiden Nesbitt 57 mins), Ryan Seager (sub Robbie Muirhead, 57 mins), Aaron Tshibola, Callum Brittain, Alex Gilbey. Unused substitutes: Wieger Sietsma, Gboly Ariyibi, Chuks Aneke, Conor McGrandles. Goals: Posh - Tafazolli (47 mins), Maddison (53 mins). Attendance: 6,465 (369 MK Dons).